I love historical romance/regency romance novels and think that this sounds like a great book. Hopefully you think so too! Viscount Julian Emory is a secret agent of the Crown on an important mission to destroy the spy ring Napoleon has established in London. The woman he’s pretending to court is one of Napoleon’s most important spies, for only she knows the identity of the traitor within the royal inner circle. He’s purposely encouraged the courtship and marriage rumors in the hope she will make a slip and disclose the traitor’s identity, but his meddlesome family has just ruined his plans. By forcing him into close quarters with Rose Farthingale, they've put both his mission and this delectable innocent in danger. 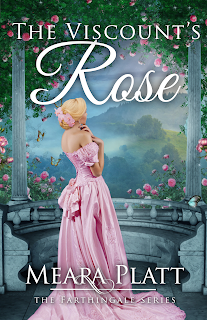 Can he keep himself from falling in love with Rose long enough to bring down Napoleon’s spy organization? "He closed his eyes a moment and swallowed hard. “Here, turn your back to me.” He set down his empty glass on the mantel. It had been full a moment ago. He shouldn’t have drained it so fast. Soft woman who sparkled like a gemstone standing before him. Begging for him to finish the job. His body heated with such intensity it felt as though the flames crackling in the hearth had leaped out and engulfed him. They hadn’t, of course. The heat came from within him, kindled by his own fiery desire." Meara Platt is happily married to her Russell Crowe look-alike husband, and they have two terrific children. She lives in one of the many great towns on Long Island, New York and loves it, except for the traffic. She has traveled the world, works as managing partner in a boutique law firm in NYC, occasionally lectures and finds time to write. Her favorite place in all the world is England's Lake District, which may not come as a surprise since many of her stories are set in that idyllic landscape. A close second is the rest of England and the British Isles, the original (and still beautiful) land of enchantment. For Meara, writing is all about enchantment, whether in the setting, the characters (such as Dragon Lords and Fae Kings), or in the author's voice. A great writer entertains, inspires, makes us laugh or cry, and sometimes makes us think. She is honored to know and learn from some of the best romance writers of our day. Meara is a Romance Writers of America Golden Heart award winner, and was thrilled to be recognized by this amazing organization. As with everything along life's journey, it is always sweeter when shared with friends, so Meara's special thanks goes out to fellow writers Pamela Burford and Patricia Ryan who have been with her from her very first baby steps as a writer.